Kim, Georgia and I were able to visit Mississippi last week. It was my first time to return to my home state in 8 months...the first time since Katrina scarred the coast. Stepping off the plane, the air smelt like "home" - as it has sincemoving to Maryland. However, by the next day, the pungent odor of pollen had invaded our sinuses like a virus. For a day each, Kim and Georgia were basically out of commission until OTC meds kicked in. I'm thinking it has a lot to do with pine trees. Trying to see friends and family in one week is a task, indeed. Especially when you're working around the sleep schedule of a 20 month old. Georgia did well...and performed for everyone like the "ham" she is. :) I was fascinated by the amount of dump trucks and construction going on...Mississippi is booming. Unfortunately, due to Katrina. We didn't get a chance to visit the Gulf Coast, however, some situations haven't changed. Businesses are destroyed, people are still living in tents, towns are virtually scrubbed away...yet,little of this is mentioned a year later. Returning to Maryland, it's become clear to me that our time in Maryland is finite. Actually, I always knew this...but this last trip kind of brought it "home." 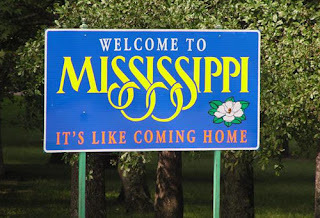 Does this mean we'll return to Mississippi any time soon. Likely not in a year...maybe not in 5 years. But I'm not interested in raising my child (or children) in this area. Many of the folks here are a bit odd...keep to themselves...unengaging...little personality. Additionally, there's much to be done with our home to get it ready for the market.